Don’t pay for cloud storage. Everybody (Apple, Microsoft, Google, mobile carriers, your internet provider, Dropbox, others) wants to sell you storage. They offer you a few gigs, maybe even 15 gigs of free space to get you started. If you’re backing up your photo library in addition to personal documents, you’ll hit that number pretty quickly. Then you’ll be on the hook for some recurring fee like $9.99/mo storage plan forever and that will only increase in the future. Skip that. The trick is is to separate your photo storage from any other cloud services you use, like iCloud or Google Drive, Dropbox etc. This allows most people to use the free basic plans for everything but photos, then claim your free private space for all your photos on Flickr. A while back Flickr.com (yahoo) made some waves by offering a free terabyte of storage. When I first tried it, the interface was clunky and it was difficult to make photos private. If you’re auto uploading every photo for storage you certainly want them to be private and easily searchable, you also want the option to make them public to share your favorites on other sites like Facebook, Instagram, Tumblr, and Pinterest. Flickr has been hard at work updating their online tools, smartphone apps, and desktop tools like uploader. Now all uploads are private until you choose to make your favorites public, or share them only with friends or family. Unlike Facebook, images can be uploaded at full size and can be edited using software built into the site. If you’re using the mobile app there is a great feature called “camera roll” that automatically and privately backs up every picture you take with your smartphone. This frees up your mobile online backup space to backup the rest of the important information on your phone in the small amount of free cloud space that you get from Apple, Google, Microsoft, and others. Once you set up Flickr, there are all kinds of things you can do with your photos. 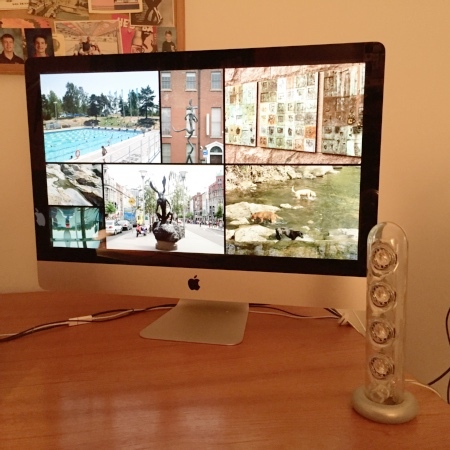 You can set up a Flickr screensaver on different devices like your laptop, Roku Box, Apple TV. 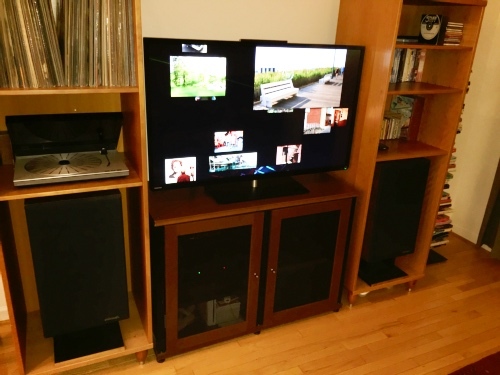 So, instead of having all of your photos hidden away somewhere, you can stream them anywhere, even with music. It’s a little work to set up but totally worth it when you consider all your photos will be automatically backed up and categorized. I’ve even found that Flickr’s web based navigation, editing tools and interface are as good as apps like Apple Photos or Picasa. 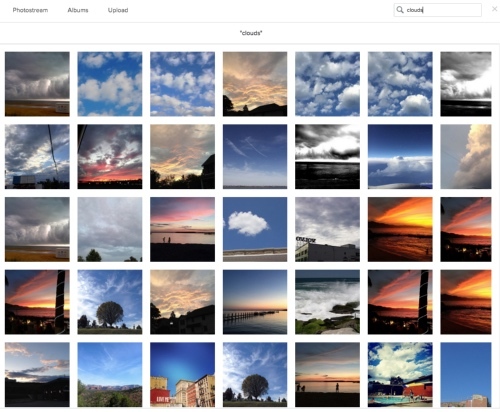 Searching for my photos that Flickr auto tagged as clouds. You can also see tag summaries in Flickr magic view. Getting Started in 3 steps. Create a free Flickr account here. If you have a Yahoo email you most likely already have one. Download the Flickr app for your smartphone or tablet. You don’t need to use the Flickr app to take photos for them to be backed up, you just turn on automatic backup during setup when you enter your account information. 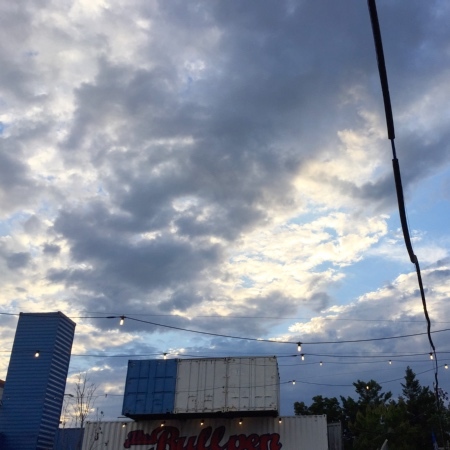 You can still use Instagram or any other smartphone camera. Everything will get backed up in the cloud, keep cellular data turned off for uploads. Once you’re comfortable and know your way around Flickr, I recommend installing the Flickr uploader for your computer. It will automatically backup your entire photo library privately and automatically. Then you can turn off any other photo cloud backups in the settings on your phone, tablet or computer. Once you’ve completed this, click on Flickr tools to find all the cool benefits like screensavers Apple TV, Roku integration, Groups, lots of other cool stuff. Both the online apps and the mobile apps are very intuitive and easy-to-use and will help you discover new features. If you keep lots of photos on your phone you’ll be able to free up a lot of that space since all of your best images will be available in the Flickr app. You’ll still be able to keep photos on your phone but you’ll be able to move all the older stuff to Flickr. It’s good to have a cloud backup. When people are asked “if your house was on fire what personal items would you grab before you head out the door?” most people say photos. Someday if your computer or smartphone dies or gets stolen, all your images are preserved. Maybe some ancestor will stumble upon them 100 years from now. You can check out how I’m using Flickr here. I’ve uploaded thousands of photos from my project and occasionally make some of my favorites public or share them on Instagram using the Flickr app on my ipad. Many users have been moving away from Flickr after they made their auto uploadr a Pro feature. There are many users who have stayed on but without a real good alternative to bulk upload. We are a photo tools startup and we just launched a solution – Zilla – a super fast Flickr uploader for photos and videos. You can take it for a spin here: http://www.zillaupload.com – would love to hear your feedback.